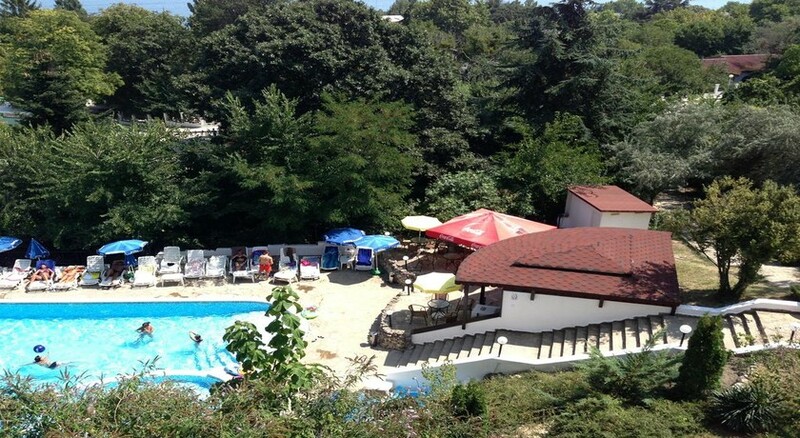 The hotel is situated about 400 m from the beaches Kabakum- Journalist and Riviera- 4 km away from the Golden Sands resort and 18 km from the city of Varna. It is ideally located for families with children- couples and individuals who wish to have a pleasant- quiet and relaxed summer holiday. A shuttle service to the beach is available. There is a public transport connection about 150 m from the hotel. 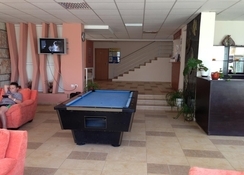 Burgas Airport is approximately 120 km away and Varna Airport is approximately 26 km away.Surrounded by green trees and a beautiful park with flowers and panorama views of the sea- this charming hotel offers a relaxing atmosphere during guests' stays. The reception is open 24-hours a day and offers a 24-hour check-out service- hotel safe and a cloakroom. There is lift access to the upper floors. The modernised air-conditioned hotel offers 64 double rooms- 4 apartments and 5 studios- and facilities such as a café- restaurant- lobby bar- swimming pool with children's swimming area- a poolside bar- sun beds and parasols- parking- a currency exchange facility and a children's playground. Furthermore- there is a newspaper stand- TV lounge- Internet access (fees apply)- room service and a laundry service (fees apply). Guests may also hire bicycles at the hotel.Each guest room has a sea view and is furnished with a double bed. 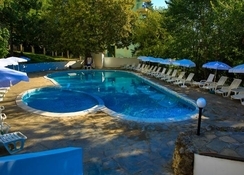 Rooms feature air conditioning- an en suite bathroom with a shower and a hairdryer- as well as a fridge- cable TV- telephone- an Internet connection and a balcony.Guests can take a dip in the hotel's outdoor swimming pool which has a children's swimming area. Refreshments are available at the poolside snack bar (fees apply). Sun loungers and parasols are laid out on the sun terrace. Guests can book themselves in for a massage treatment (fees apply). The entertainment facilities also include table tennis- beach volleyball and pool/snooker (fees apply to the latter). Sun loungers and parasols may be hired on the sandy beach.